Everything reassembled. The swivel pad is in place, the screw is blued, and the frame is painted (the hammered paint came out nicely, I think). The handle (not shown) is still a bit bent, but some time with a vise will fix it. I got impatient and put on the pad before fixing the handle, which was a stupid mistake. 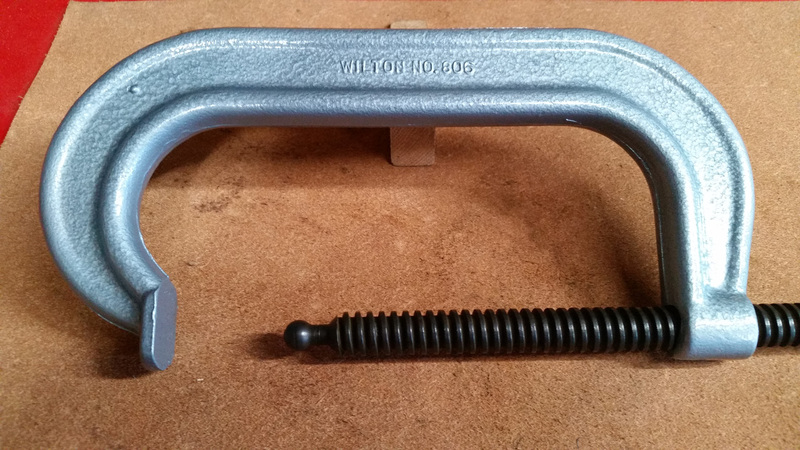 Here’s a quick little post showing a Wilton 806 C-Clamp that I recently restored. These are still made by Wilton, but this model is no longer made in the USA, I believe. 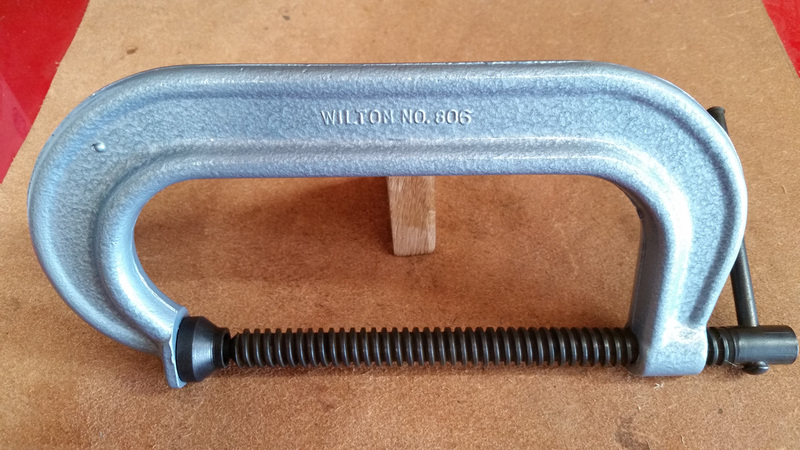 It’s drop-forged and should last for many decades of use in my shop. 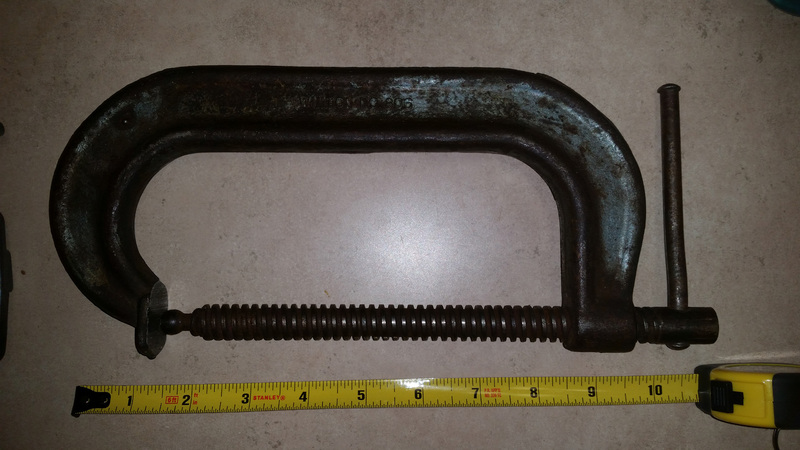 It’s a pretty hefty piece of iron, and these things are always worth spending 20 minutes and a couple bucks restoring. 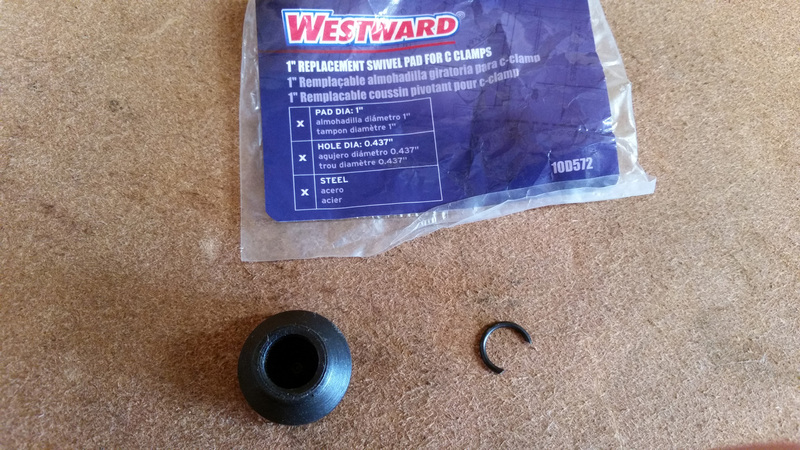 A couple of tips if you’re thinking of buying one for use: (1) make sure the screw is not damaged (if it is, don’t buy it); and (2) the swivel pad can be replaced for about $5-12 dollars, but you’re better off if it’s still there, unless you buy the clamp itself cheaply. For proper fit, make sure the swivel pad and the ball end of the screw are a very close match (within about 0.005″). There’s no need to go nuts on restoring something like this, which will be used hard and (let’s face it) be abused often enough, but a few minutes spent cleaning it up makes it a much nicer tool to hold and use. As acquired. The clamp is missing the swivel pad (a common problem), the paint is mostly gone and there is rust, and the handle is a little bent. The screw is undamaged, which is what counts. I removed the screw assembly. Since the pad was gone, it just unscrewed. 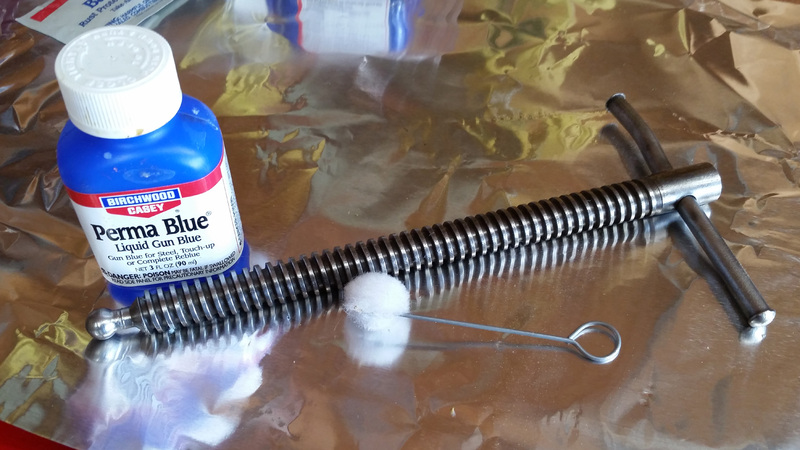 I cleaned it up thoroughly on a wire wheel on my bench grinder, then I used a cold blue solution to give a little protection to the metal. It will still require a coat of paste wax to prevent rust. I used a wire wheel in my drill and stripped the C-frame to bare metal. I used a hand file to knock off some of the sharp parts of the casting (took all of three minutes), and then I gave it two coats of Rust-Oleum Hammered in light blue (no. 7212830), which was fairly close to the original blue color. I just ran the screw partly in, half-heartedly masked it with tape, then painted. After painting, I simply wire-wheeled the paint overspray off the screw, which I would have done anyway. I did paint the upper pad, but I might sand that part to bare metal if it bothers me. I spent way too much (like $11) on a replacement swivel pad. You just slide the ball end of the screw into the pad, then use a little screwdriver to push the C clip into the hole, locking it in place semi-permanently. This part would have been cheaper on Zoro. The ball was 0.431″ and the pad hole is 0.436. A fairly close fit is required for it to work properly.